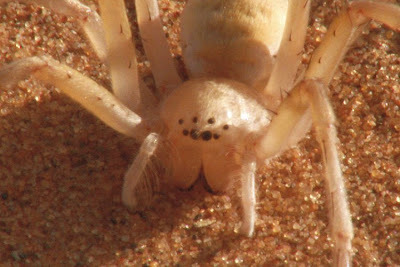 There are three known spiders that elect to roll down sand dunes as opposed to walk down. 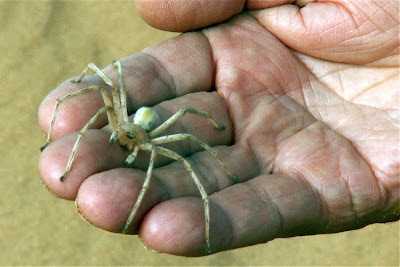 The palm-sized rolling Sahara spider (Araneus rota) is one of them. But this isn't just any roll. They don't tumble down the slope like we used to when we were kids. That's too slow. No, this spider does it by doing handsprings. Check out the spider in action. See? Cartwheels! Why walk across the sand when you can do cartwheels? It does so by getting a running start and then springing into the cartwheel, which allows it to travel at around 5 mph. That's faster than the walking speed of your average human. I know what my nightmares are going to be tonight. I'm stumbling across the barren wastes of the Sahara, weak and delirious with thirst, the sun a blistering orb overhead. But off in the distance, awash in a shimmering heat wave, I see a snow cone stand, complete with every flavor known to man. All I can do is stumble towards it. But then I hear a skittering noise behind me. I turn to see spiders cartwheeling towards me, and I can't outpace them. This face will be the last one I see. On a more scientific note, these spiders are of great interest to bionics engineers such as Ingo Rechenberg of the Berlin Technical University, who has researched this spider. 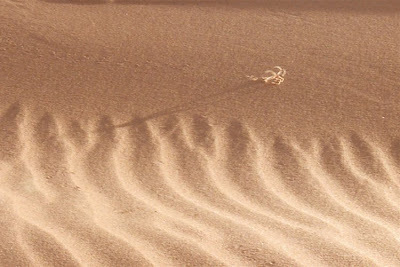 The spider's means of ambulation might just provide a possible new model for vehicles exploring the surface of mars. Great. Bionic spiders on Mars. That'll be my next nightmare. Thanks for the article, Karen. Neil took these photos in Davis, CA. It might not be readily apparent to you, but these are some of your favorite bugs. They've been featured in countless children's movies and books, they're on hallmark cards, and they're one of the many symbols of Spring. You're looking at ladybug larvae. 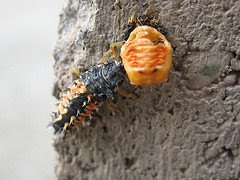 More specifically, you're looking at Asian ladybird larvae (Harmonia axyridis). These insects were introduced to North America decades ago for pest abatement, and now they're nigh on ubiquitous. But they don't just dine on aphids, though we appreciate that. 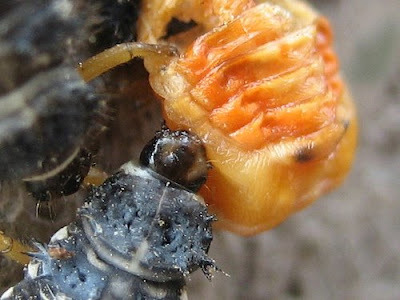 These insects also dine on other ladybird beetles, including their own species, as seen in these graphic photos, where Harmonia larvae are feasting on Harmonia pupa. Can't a ladybird pupate in peace? That's right. Ladybugs are cannibals. That's like finding out that Care Bears and Ewoks and unicorns are cannibals. I just sucked some of the sunshine out of your day, didn't I? Sorry about that. I'm sure Neil apologizes, too. Thanks, Neil. What's this? Perhaps close-ups of new fiber weaves or shots of this year's quilting contest runner-up? Is this what a teddy bear's hide looks like under magnification? Is it soft? Can I make a pillow out of it? 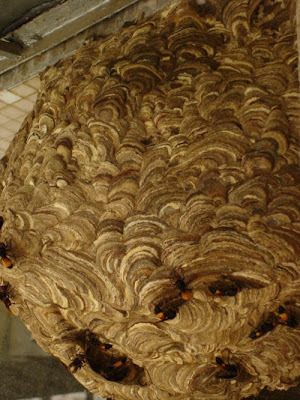 No, you're looking at an obscenely large wasp nest. UPDATE: Neil has identified this as a hornet. Specifically, Vespa affinis. 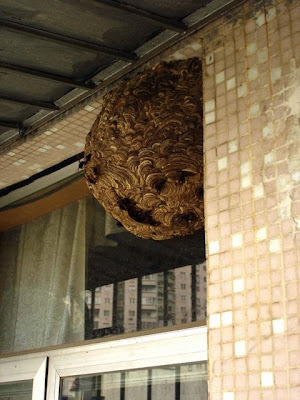 These shots were taken by a Russian blogger who found these industrious wasps constructing a sprawling compound beneath the eaves of his flat. Any clue as to what kind of wasps these might be? Some sort of uber-paper wasp? Check out the bottom picture for a close up of the wasps themselves, then tell us how afraid we need to be. 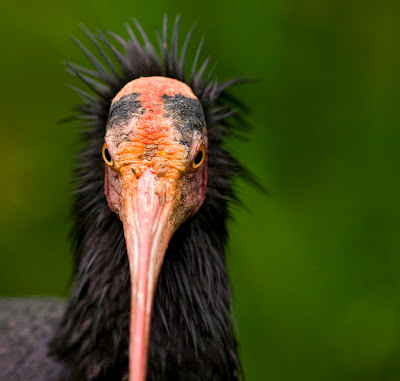 None of the diverse clan of ibises is going to take home a beauty contest trophy--not once the judges get a good look at the heads. 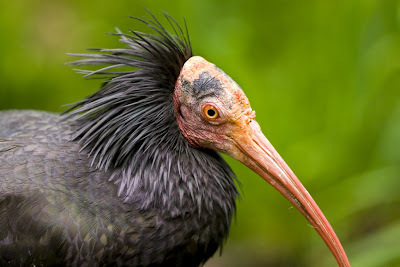 The Northern bald ibis is no exception. To be honest, I have yet to come across an attractive bald bird. Birds, even the head, are meant to be feathered. So I'm not disparaging the Northern bald ibis. Not by any means. In fact, I'd like to see more of them. They're teetering on the verge of extinction in their native Mediterranean, African, and Middle Eastern lands. It's only due to captive breeding programs and conservation efforts that these birds stand a chance. Would that the Egyptian god Thoth would intervene on behalf of the ibis (of all the animal heads Thoth could have been adorned with, he got dealt the ibis head). How about it Thoth? Any chance you'll take a break from your re-write of the Book of the Dead and judging souls to take up the Northern bald ibis's plight? 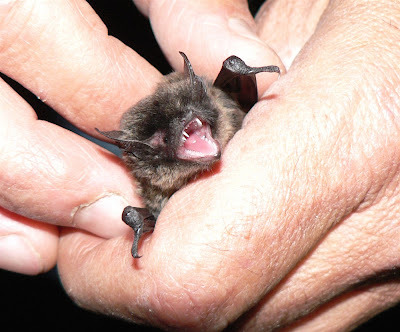 Morgan sent in these photos of bats having been plucked from their roosts and petted by humans. No bats were harmed in the taking of these photos. If anything, some seemed to enjoy having their heads stroked. 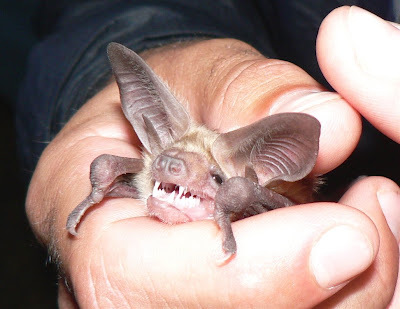 These bats are, in order of appearance: 1) a silver-haired bat, 2) a pallid bat, 3) another pallid bat, 4) Myotis californicus, and finally, a bat that looks like a bison with wings and big ears, 5) a myotis bat. Monica's toddler looked out the open back door of their California central valley house. He said, "hi itty pider! ", which brought mommy to investigate. She found this monster lurking in the eaves. Monica gathered enough courage to get a dollar bill close enough for the photo to give us a sense of its size. Anyone know what type of spider this might be? Should Monica be afraid? Should she not have revealed how much cash she had on hand to the spider? What more can you want of me than this photo? It's got it all. A gaggle of marabou storks, and a flock of griffon vultures. Looks like there might even be a hooded vulture or two in there. Oh, and a carcass. This shot was taken at Kruger National Park. Seems like the park officials there have set up vulture restaurants, where the keepers layout carcasses for the vultures, so as to provide a sanctuary for them. I wonder what kind of tippers vultures are. Here's today's buzz word: hydrophobicity, the property of being water resistant. 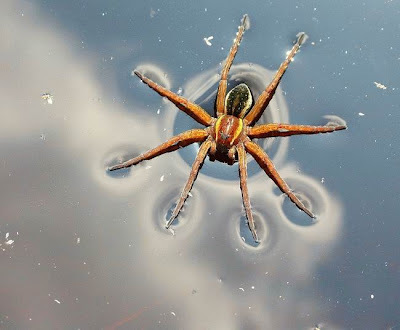 Some spiders, when placed on the water's surface, simply get wet and sink. But many are hydrophobic to some extent and can ambulate across the water's surface much like they do on land. Still others, like those in the family Pisauridae, can row across the water. But all spiders, when placed upon the surface of a human soul, can devour it. I'm guessing that this spider belongs to the family Lycosoidea. Anyone care to confirm or correct? Wesley forwarded this article from the mental floss blog. It's a tale of six fascinating ant species. I'll bring you three of them. 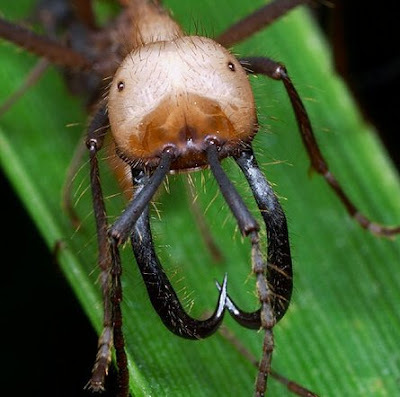 First we have a Madagascar specimen called the Dracula ant (Adetomyrma sp.). But I don't think Dracula did anything quite like these ants. You see, they feed on the blood of their own larvae. 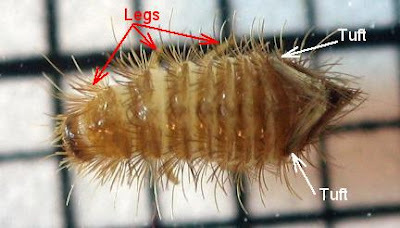 Here's how it goes: the larvae are larger than the adults. The adults bring corpses of fallen insects back to the colony, which they feed to the larvae. The larvae in turn digest the offerings and secrete the protein in liquid form, which the adults live off of. I've seen human variations on this same behavior, where the parents have raised their kids to be dairy cows, or some sort of host upon which to feed. Next we have Gliding Ants (Cephalotes atratus), from the rain forests of South America. They've developed a form of gliding, not unlike the ability found in flying squirrels, that allows them to fall from a tree branch and glide back to the tree to land on its trunk. That way they can quickly make their way down the tree without having to land on the ground, where they'd make easy prey for would-be ant predators. 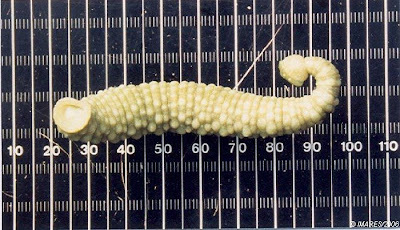 When the larvae are mature and turn into pupae, they stop producing the pheromone, and the army settles down to form a nest using their own bodies as building material. 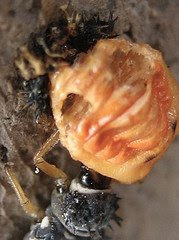 While the pupae mature, the queen busies herself laying new eggs. 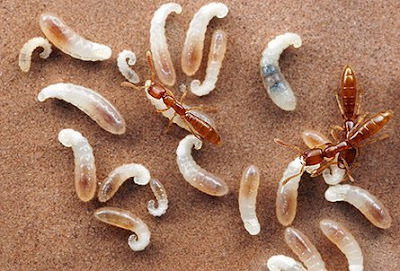 When new ants emerge from the pupae, the eggs turn to larval form and produce more pheromones, meaning it is time to march off for food. See what you get when you put the kids in charge? 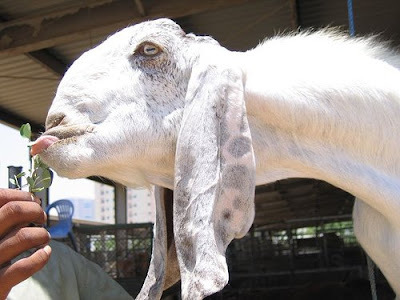 The Damascene goat has several things going for it. First of all, it's a goat. Add to that long, floppy ears, a long, curved neck, and that truncated snout, and you've got yourself a winner. Literally; these goats are the object of popular beauty contests in the Arab world. This one knows how to compete, what with that dainty tongue. 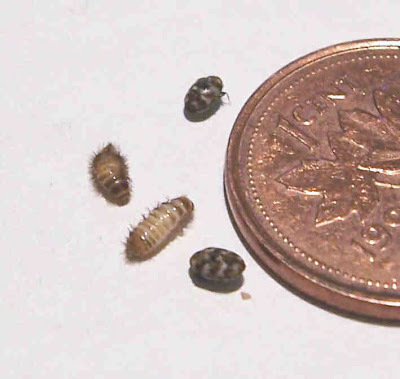 As Rebecca described it, she found "whole bunch of little larvae squirming around in the carpet." Turns out that she, like so many people, has carpet beetles. Many households have them, and most of don't even know it. Their presence isn't a commentary on the cleanliness of your house; they just happened to find you. In fact, once you find them, there's no real chance of getting rid of them. 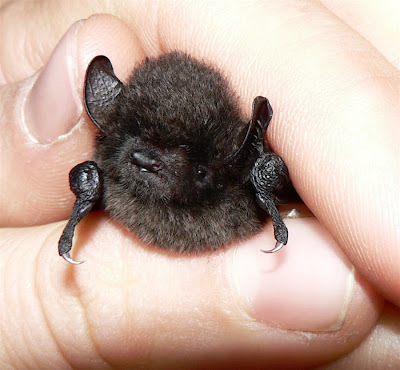 These creatures are typically found in bird and mammal nests, where they dine on the various bits that are shed by the nest's inhabitants (hair, wool, feathers, skin, exoskeletons of other insects, etc.). And guess what your bedroom is? That's right, a mammal nest. 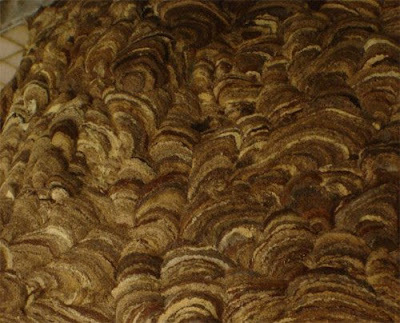 They have adapted to low-water living, so they can live in even synthetic, dry carpeting their whole life. Your foodstuffs are safe from them, since these guys specialize in eating the things more respectable bugs wouldn't touch, but your insect collections, taxidermy, wool products, natural-fiber carpets, and museum specimens aren't. You're welcome people. When you go to bed tonight, you're going to wonder about every little tickle you feel, and about just what kind of ecosystem has established itself beneath your bed. 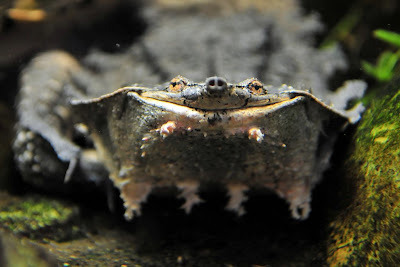 The matamata turtle is one of those creatures with a deceptively cheerful face. What truly lurks behind that smile is a cold-blooded (literally) killer. That snorkel of a nose and its serpentine neck allow it to lurk underwater for hours on end with nary a movement. Its neck and head a very sensitive to subtle movements in the water caused by swimming fish. And when it strikes, it does so by hinging open its cavernous mouth so fast that its prey is sucked in. So, again, don't let the smile decieve you. The same can be said of smiles from salesmen and politician's smiles. 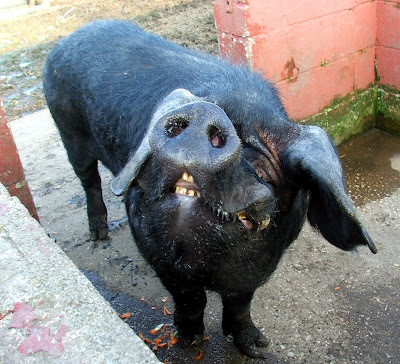 This pig does seem to be happy. And dare I say, he sure know how to ham it up for the camera? Enjoy your weekend folks. I know this pig will. Here's a charming tale from the turkey vulture front. This one comes to use from Wildlife Friends, the wildlife rehabilitation center for Best Friends. 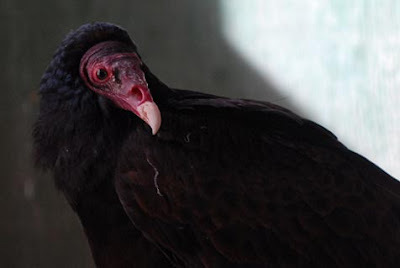 A call came in from Colorado City, Arizona, that a turkey vulture was trapped in the bear pen of the defunct local zoo. When Wildlife Friends staff showed up, they did indeed find a vulture. It was dehydrated and emaciated, with an injured eye. Todd Moore collected the bird, and had to endure its constant attempts at regurgitation (a self-defense mechanism) and the accompanying stench on the ride back to the rehab center. It took more a battery of tests and a month of proper care for the bird to begin to recover. It turned out that it was suffering from West Nile virus, and that its injured eye had been blinded. That injury made it no longer suitable for release. But as luck would have it, there was a waiting list for turkey vultures. Turns out that there were quite few educational groups looking to get these birds on their rosters. One-Eyed Jack soon found himself a new home in the Adobe Mountain Wildlife Center. Great job, everybody, for taking care of this bird. The world needs more people like you. You are looking into the alien face of a Holothurian from the Benthic Zone. They are most often found in the gamma quadrant of the Loratadine star system, though most recently they've made incursions into the Paxil super cluster. All right, this creature may not be an alien, but he is a holothurian from the benthic zone. Or, in layman's terms, a sea cucumber that can be found scavenging among the debris at the bottom of the ocean. New word: if you're one of those creatures that abides in the lowest level of a body of water (benthic zone), you are called a 'benthos'. Try dropping that on the next cretin who cuts you off in traffic. That'll show him. Christopher sent these photos along, and he's pleased to announce that the Smithsonian has opened their United State Arctic Research Program (USARP) website. So for all of you fans of freezing water, the deep sea, and gigantism, go and have fun exploring the site. You'll find all sorts of denizens like our friendly holothurian here. 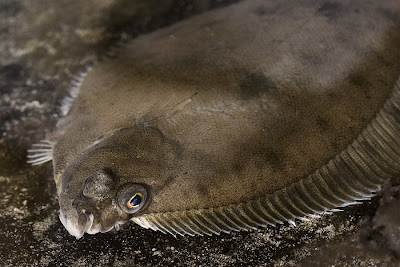 The European plaice is closely related to the sole, and is Europe's most commercially important flatfish. 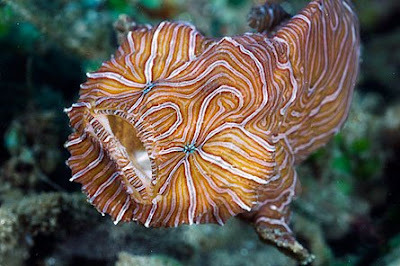 The face of this fish is a bit confusing, but don't be alarmed; it's supposed to look twisted. You see, the larval plaice is born with its eyes on both sides of its head, like most other fish. But as the larvae matures, one eye migrates across the skull to line up with the eye on the other side of its head. That way, one eye isn't dragging through the mud and sand as the fish swims about on its side. I see the potential for a good children's book here. It's about a larval plaice who is separated from his family at birth, and he's instead reared by a school of attractive angelfish. It soon becomes obvious to the beautiful angelfish that the plaice isn't one of them, for he has drab colors, tends to lie flat on the ocean bottom, and one of his eyes is migrating. The angelfish mock him and tease him, and the young plaice feels dejected. But then sharks come and devour all of the angelfish--everyone, save for the young plaice. You see, the sharks failed to see him, camouflaged and flattened against the seabed as he was. Okay, it might not be a happy children's story, but I think there's a useful message there. AskMen.com has just done a top 10 line up of ocean rivalries, complete with footage from National Geographic. Ever wondered what would happen if a Portuguese man-o-war crossed tentacles with a sea turtle? How about a mantis shrimp versus a hermit crab? Well, now you can find out. Don't worry; each of these rivalries is naturally occurring, and the fights weren't staged. Here's one such encounter: a dogfin shark meeting a pacific octopus. Watch as the blank defeats the blank. This just in from the good folks over at Nature Blog Network, of which I am a proud member. They've featured Ugly Overload in their weekly spotlight. They interviewed me in preparation for the feature, so you'll find some of my so-called wisdom and inspiration for Ugly Overload there. Also, while on Nature Blog Network, poke around and see what other sites are part of the network. Lots of good sites. Lots of good people. 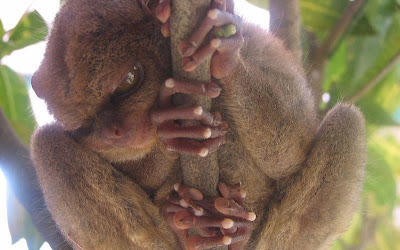 You think tarsiers looks freaky with their eyes wide open? How about when they squint them? How about when they look down upon their human prey from their lurking spot high in the tree canopy, the knuckles of their long fingers and toes white as they squeeze a tree branch in anticipation of squeezing the life out of you? It's the face of evil. 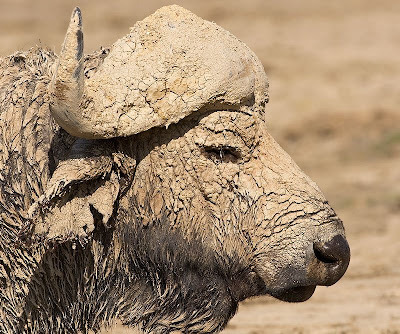 Few creatures make being slathered in mud look as good as the cape buffalo. 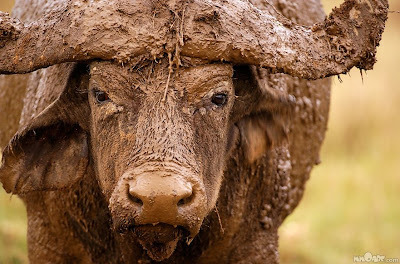 I picture the big bovine heaving a great sigh of relief after wallowing. Mud means a respite from the heat and the flies. 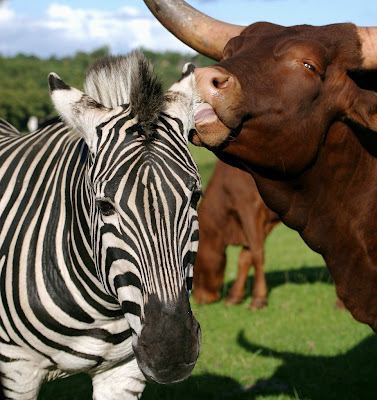 These beasts were once one of the Big Five among trophy hunters, along with elephants, rhinos, leopards, and the lion. They are known for being surly and dangerous, which is a useful reputation to have when dealing with hunters. They are, of course, herd animals. But the herds are comprised mainly of cows and calves. Young bachelor males tend to roam about in their own bands, and I can't imagine a more annoying group of hoofed animals on the Serengeti. Juliet showed typical teenage foolishness when she asked what was in a name. Names are important. My wife and I deliberated for quite some time over the naming of our children. Scientists are compelled to name everything. Names have power. So when you look at the creature below, what are some of the possible names you might think of? Morgan, who sent me this photo, thought of "brilliant pygmy lobster" and "magnificent violet lobster". Or you could go with "spiny jeweled lobster" or "resplendent lobster of joy". So many possibilities. But guess what this creature's common name is? 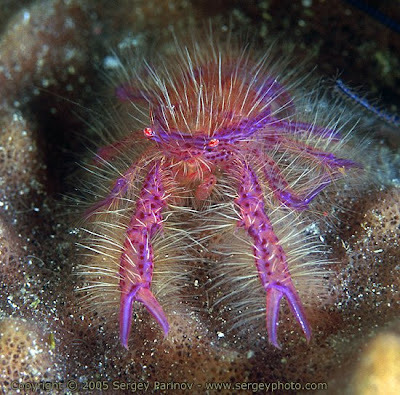 Hairy Squat Lobster (lauriea siagiani). As Morgan asks, where's the justice in that name? Morgan saw that I had been on a spree of posting on marine parasites and predators, and so thought to add some more ugly to the salty stew. You're looking at what is described as "red, sausage-sized structure [which] is the external portion of an unusual, parasitic barnacle, Briarosaccus callosus." Charming. 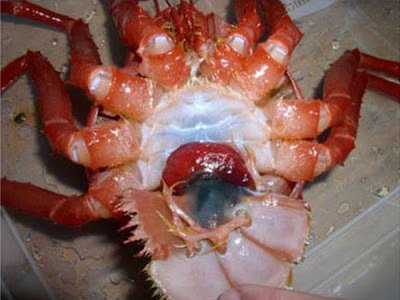 These barnacles, which turn red as they become engorged with crab their own hemoglobin (thanks for the correction, anon3), render their hosts sterile, use the crab's energy to produce swarms of baby parasitic barnacles, and can even induce the crab to protect the barnacle and assist with larval release. The only danger I've ever thought of in association with barnacles is the occasional knee or palm scrape I get when I clamber about tidal pools. But then, my experience has been limited to benign barnacles (a possible band name), and I'm not a crab. I can't imagine what it would be like to have a blood-filled barnacle sticking out of my belly button and telling me what to do. Suddenly ticks and lice don't seem so bad. Thanks, Morgan. And good luck with your BA thesis. Hummingbirds are among my favorite creatures. They bring nothing but happiness with each feverish beat of their wings. But, like most of you, I've never seen a baby one (like baby pigeons, which I don't believe exist). 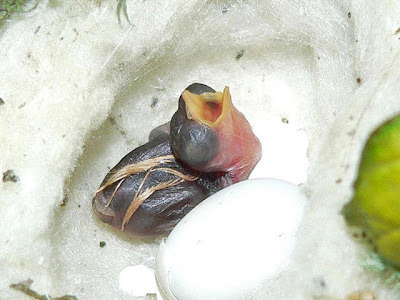 So here you go: a baby hummingbird. 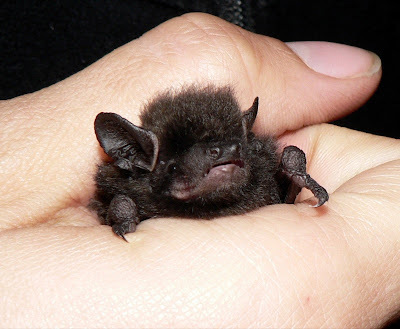 I know most of you will balk at this little one being posted on Ugly Overload, but come on. Only the endearing, expectant opening of the beak mitigates the image of what is otherwise a featherless bird. And birds were meant to be feathered. This is fledgling 'A' of a set of twins ('B' has yet to hatch). Any tale involving twins is doubly dear to me (pun intended), since I have twin daughters. This pair grew to adulthood and went about their way, lapping at nectar and performing aerial feats that defy comprehension. I hope for similar success for my twins, save for the nectar and flying bit. 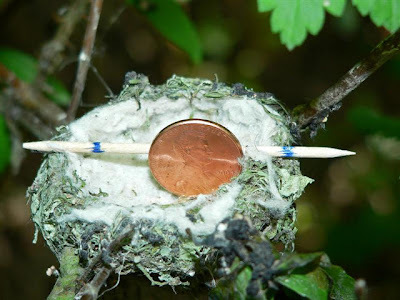 And just to put this all into perspective: this is the size of the nest. Makes the whole thing even cuter. Thanks for the link, Theodosia. I understand that as a male seal you only have so many means at your disposal for attracting lady friends, for building up a nice respectable harem. You can't sport a bright colored coat, not with killer whales and polar bears lurking about. You can't do a graceful dance, not with that bullet-shaped, fin-propelled body. But you can get big and belligerent and loud--that always seems to work. You can even grow an elephantine nose and flaunt it with pride. 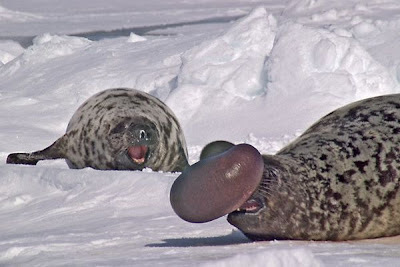 Or, you can go the route of the hooded seal (Cystophora cristata), like the male seen below on the frozen banks of the St. Lawrence River, and inflate your nasal membranes (the hood is actually a smaller inflatable sac on the forehead, which can just barely be be seen in this photo). I guess that as a female, an impressive inflated nasal membrane is as good a mating determining factor as anything else. The lady seal watching the display seems satisfactorily impressed. Courting my wife took quite a bit more convincing than was required of this seal, but I can't complain. In place a nasal membrane and an appetite for fish, I've got my trusty frontal lobes, opposable thumbs, and mediocre blogging skills. I'm having a hard time digging up much detail on Pontobdella muricata linnaeus, a marine leech. But it's looking like they feed of the gills of their hosts, and once engorged with blood, they politely disengage and drift away. One source says they can then go upwards of 18 months without feeding again. I'm not happy with the existence of such long-lived leeches, though I have no idea how long leeches live in general. But there's some silver lining to be found in the fact that they don't need to feed that often. That must be some consolation to their oceanic hosts. Behold one of the newest additions to the frogfish family: Histiophryne psychedelica. That's right. Check out the Latin name. See the word psychedelic in it? 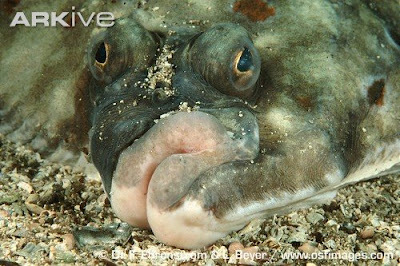 The describer of this species, one Ted Pietsch, gave it that name because of the fish's coloring. This frogfish differs from its frogfish cousins in several regards. For one, those colors never change. Other frogfish change their colors camouflage-style to blend in with its surroundings. Not so with psychedelica. And then there's the fish's locomotion. Sure, it crawls around like other frogfish. But this little guy is also able to hop by squirting jets of sea water. 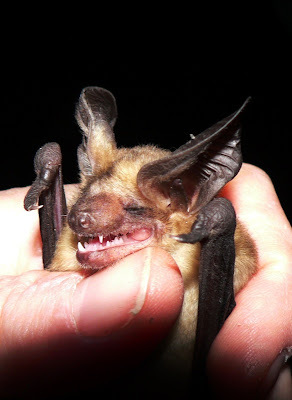 Last but not least, check out its face. See anything unusual? It's in the eyes. Both are forward facing, giving it binocular vision. So, we see that sometimes the most surprises come in small packages, and such is the case with this four inch fish. I'm just happy to have another frogfish inductee. You've met axolotls on Ugly Overload before. But you've never met DooDad and Narkezy. They are denizen's of Cynthia's aquarium and are beloved for their blue eyes and pouty lips. 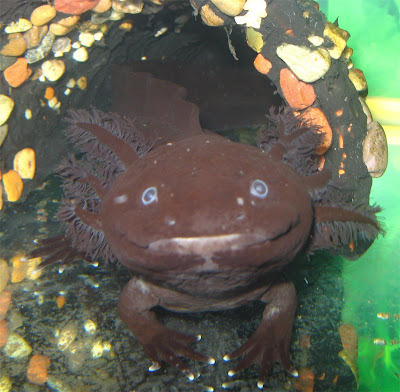 Axolotls make for interesting case studies, and scientists can't get enough of them. For one, they never metamorphose into an adult phase, and therefore remain completely aquatic and begilled. For another, they are easy to breed and have large embryos. And last but definitely not least: they can generate most of their body parts--a skill I've been trying to master with mixed results. Wild axolotls are close to extinction, since their native home in the lake underlying Mexico City is severely polluted. And what axolotls aren't killed by the pollution are beset by the introduction of African tilapia and Asian carp into their waters. 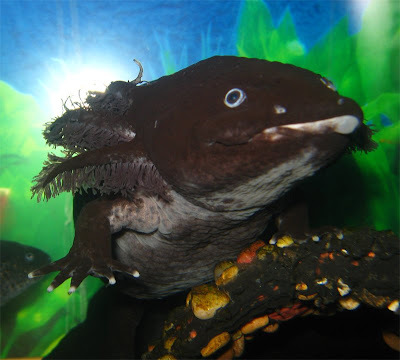 It's quite possible that axolotls will persist only as a as a captive bred aquarium species. So here's to Cynthia and all axolotl owners the world over. The species is depending on you. UPDATE: David Steen reminds me not to write off the dedicated professionals who are working to preserve them in their natural habitat. Here's to them as well. 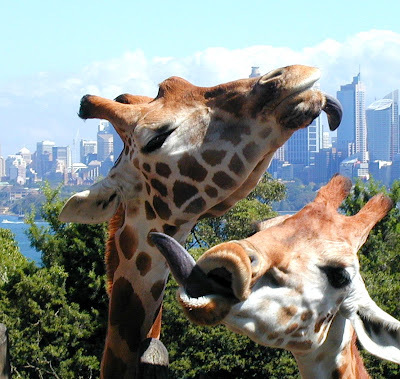 It's my belief that when it comes to tongues, ungulates get short shrift. Why do snakes and canines get all the attention? 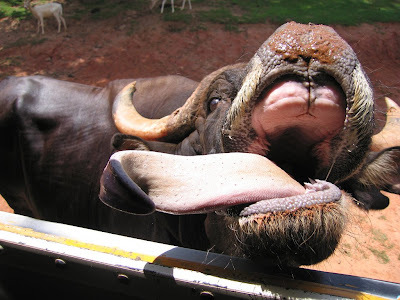 Bison, buffaloes, cows, giraffes, all of them have enormous, very useful tongues. Tongues they seem to be proud of. And here's proof. 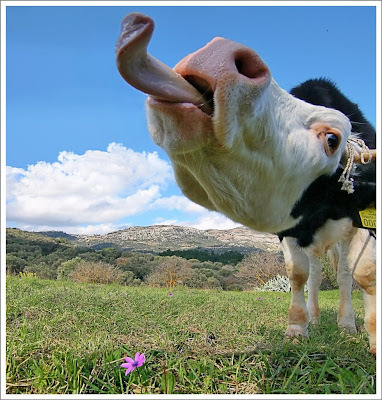 These tongues can even be instruments of inter-species cooperation, goodwill, and hygiene, as seen in the last photo.